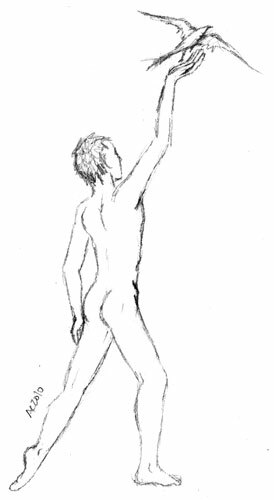 Just a little sketch for Saturday, an experiment in figure drawing. I didn’t feel like repeating the “reaching for the unattainable” post again, so this time I gave him something to set free. Let’s hope it comes back, and brings him some clothes. I love the line of his body from his left foot up through his right hand. Beautiful.